After scoring strong results at Valentino Rossi’s home race in Mugello, Movistar Yamaha MotoGP heads to Jorge Lorenzo’s home race in Montmeló for this weekend’s Gran Premi Monster Energy de Catalunya. After a sensational race in Italy where Movistar Yamaha MotoGP’s Valentino Rossi and Jorge Lorenzo scored the team’s third consecutive double podium, they head to the Circuit de Barcelona-Catalunya for the seventh round of the championship. After being serenaded by home fans for his third place podium finish in Mugello, Rossi is excited to head to the next round in Montmeló. He has been leading the championship standing since the start of the season and is clearly in great shape. The Doctor holds a record of six premier victories with wins in 2001, 2002, 2004, 2005, 2006 and 2009 and is also one of only two riders who have won the race in Catalunya from pole position, the other being his teammate. Lorenzo has every reason to be happy; having found a good set up for his YZR-M1 he has won the last three races and currently holds second place in the championship. He hopes to continue his winning streak this weekend and bridge the six-points gap to his teammate in the overall standing. As Montmeló is a circuit he knows and loves, the Majorcan fancies his chances to add a fourth Catalan premier class victory to his earlier wins in 2010, 2012 and 2013. The track hosted its first MotoGP race in 1992 and has been a crowd’s favorite ever since. It has won the IRTA ‘Best Grand Prix’ trophy in 2001 and is known as one of the most atmospheric and exciting races on the calendar. The most famous battle in Montmeló happened between Rossi and Lorenzo in 2009. Monster Yamaha Tech3 Team riders Bradley Smith and Pol Espargaro are geared up and ready for round 7 at the Gran Premi Monster Energy de Catalunya. Both riders will intend to clinch two strong results after concluding the Italian Grand Prix in positive style aboard their Yamaha YZR-M1’s. 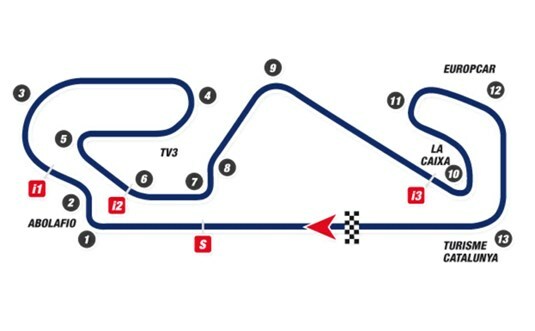 The twisting 4.7 kilometre circuit has held many memorable MotoGP battles in recent years and Smith as well as Espargaro will aim to ride to glory in the satellite riders battle in front of the ever passionate Catalan crowd. Bradley Smith produced his best performance so far this season by clinching a hard fought result of 5th at Mugello and will seek put himself in the mix for a top six placement in the 25 lap sprint around the Circuito de Catalunya. He currently sits in 6th in the championship and at the front of the satellite MotoGP riders and will look to continue his positive form by adding more points to his tally of 57. Furthermore, Pol Espargaro will be intending to speed to a top finish in front of his adoring home fans by battling with his teammate and challenging for the leading satellite bike position under the Catalan sun. The Spaniard determinedly bounced back from his recent arm surgery with an impressive showing in Mugello where he seized 6th and will look to go one step further at his home Grand Prix. After the home race in Mugello, Barcelona will host the seventh race of the 2015 season, the second on Spanish soil, which is scheduled this weekend at the track on the outskirts of Barcelona. Loris Baz, Open class winner on the Italian track and second in the standings only behind Hector Barbera, comes to Spain motivated to reduce the gap to his rival and score points once again. It will be a welcome return to the Catalunya circuit where he raced for the last time in 2008. Stefan Bradl is looking forward to jump on his Yamaha Forward bike again. The German, who was forced to retire prematurely at Mugello, proved to be consistent all weekend long and is aiming to lead the Open class in Montemelo.